Derivation of primary cell cultures from solid tumor material involves multiple critical handling steps. 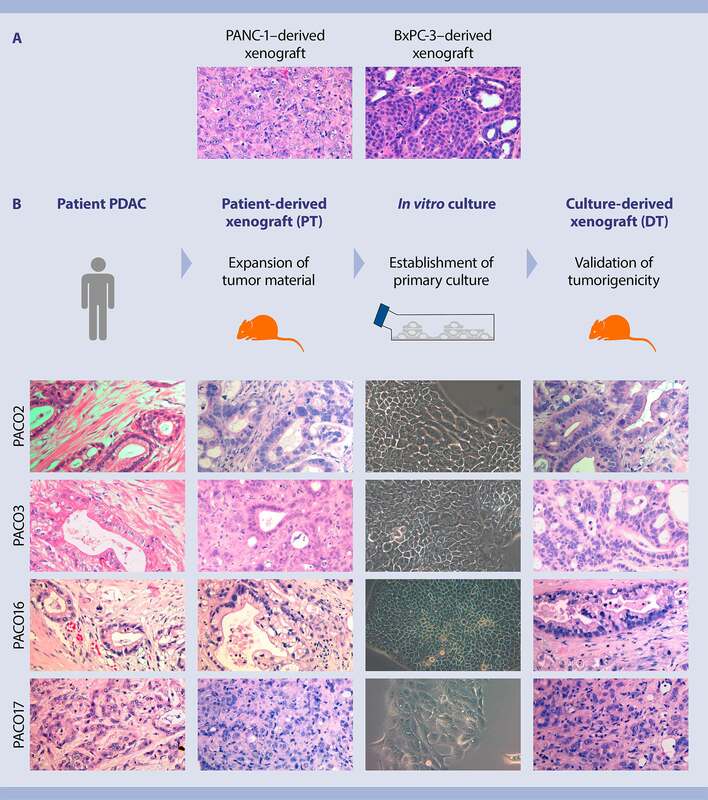 To improve this complex procedure, we developed a workflow allowing for rapid and flexible tissue preparation for subsequent derivation of primary tumor cell cultures using our novel Pancreas TumorMACS Medium. 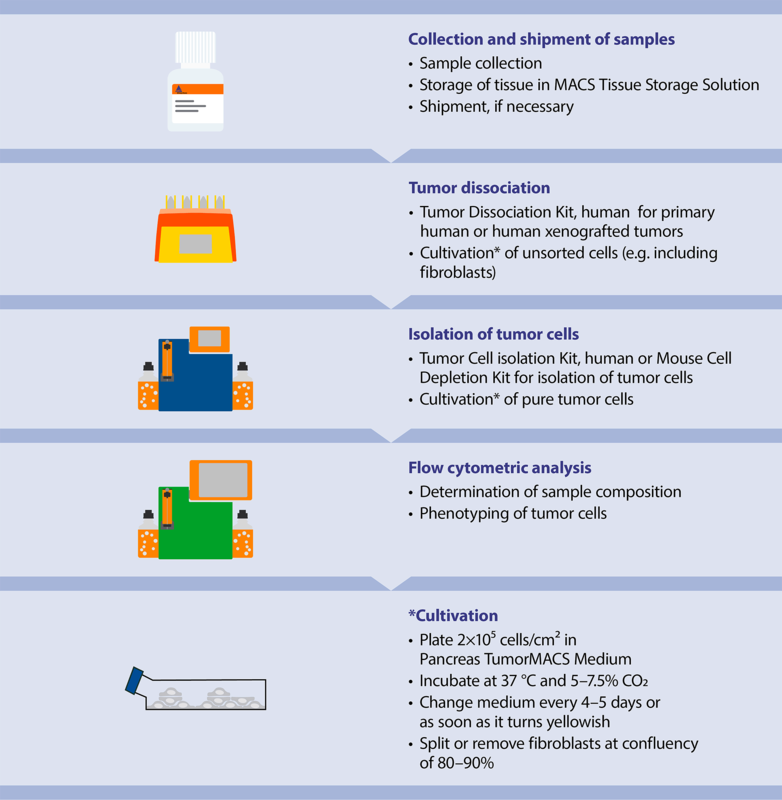 The workflow enables highly standardized cell line derivation and still offers the opportunity to seed dissociated tumors and/or selected cell fractions such as isolated tumor cells or tumor subpopulations. The gentleMACS™ Dissociator in combination with the Tumor Dissociation Kit, human ensures rapid and standardized dissociation of tissue samples into single-cell suspensions. No matter the tumor entity, gentleMACS Technology provides excellent cell viability and functionality for further downstream cell separation, analysis, and culture. The presence of red blood cells (RBCs) hampers the accurate determination of cell viability as well as absolute cell counts for tumor-infiltrating leukocytes, cancer stem cells, and other tumor-resident cells. Labeling the cells with CD235a (glycophorin A) antibody allows for the fast and simple discrimination and exclusion of RBCs for subsequent flow cytometric analysis. Single-cell suspensions from human melanoma tissue were prepared using the Tumor Dissociation Kit in combination with the gentleMACS™ Dissociator. Single-cell suspensions contained 17% red blood cells (RBCs). To exclude the RBCs from subsequent flow cytometric analysis, the cells were labeled with CD235a (glycophorin A) antibody. 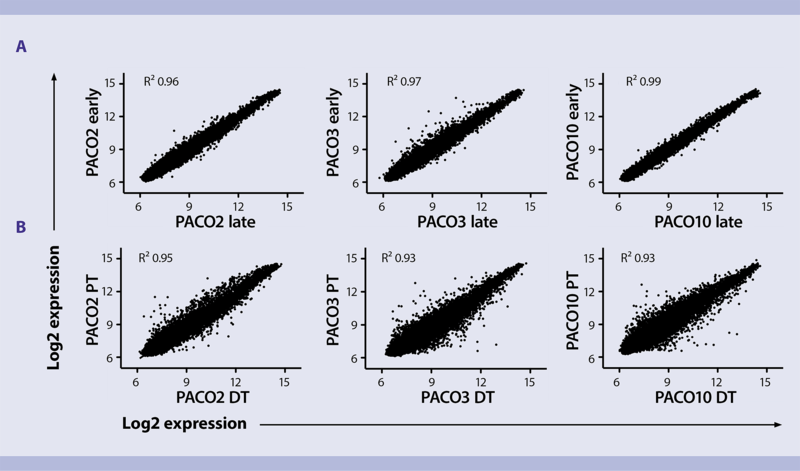 This prevents overestimation of cell viability and absolute cell count due to RBCs that falsely appear in the PI- fraction. Finally, viability amounted to 86% at a yield of 5.8×10⁷ cells per gram of tissue. Get more information on storage and dissociation of tumor tissue here. Pure tumor cells can be isolated by depleting non-tumor cells from dissociated tissue. We have defined a cocktail of antibodies recognizing all cells in the tumor microenvironment but the tumor cells. Using these antibodies coupled to MACS® MicroBeads can eliminate >95% of contaminating cells in less than 20 min. Depletion of non-tumor cells from dissociated primary tumors can be performed by magnetic cell separation using the Tumor Cell Isolation Kit, human. 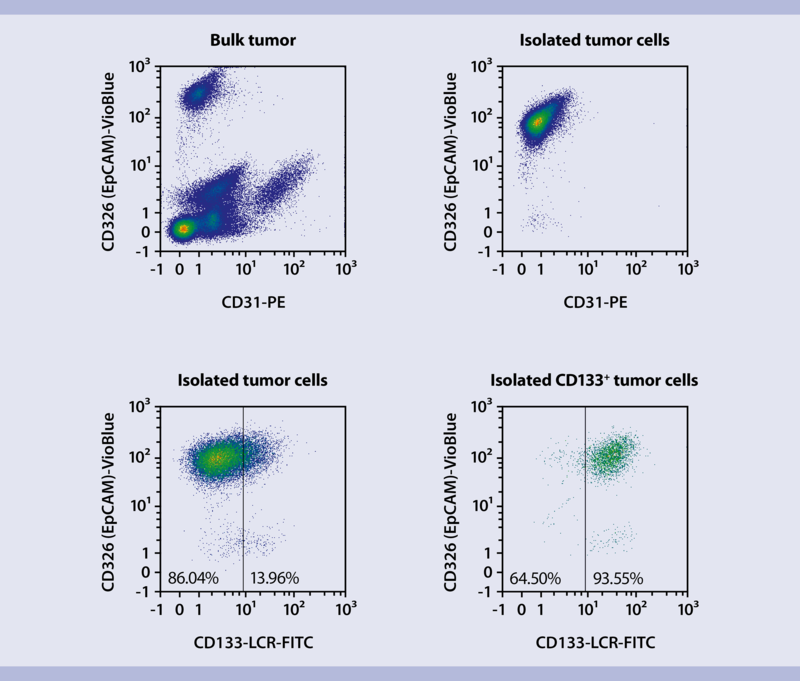 As the isolated tumor cells are untouched, subsequent tumor subpopulations can be isolated by MACS Technology as shown for the isolation of CD133+ cancer stem cells. Ovarian carcinoma tumors were dissociated with the Tumor Dissociation Kit, human and the gentleMACS Octo Dissociator with Heaters. The depletion of non-tumor cells from the dissociated primary tumors was achieved with the Tumor Cell Isolation Kit, human. Purified untouched tumor cells were obtained, eliminating >95% of contaminating non-tumor cells (A). Untouched human tumor cell isolation from ovarian carcinoma pleural effusion samples containing low initial frequencies of tumor cells allowed for subsequent isolation of tumor subpopulations by MACS Technology as shown for the isolation of CD133+ cancer stem cells (B). 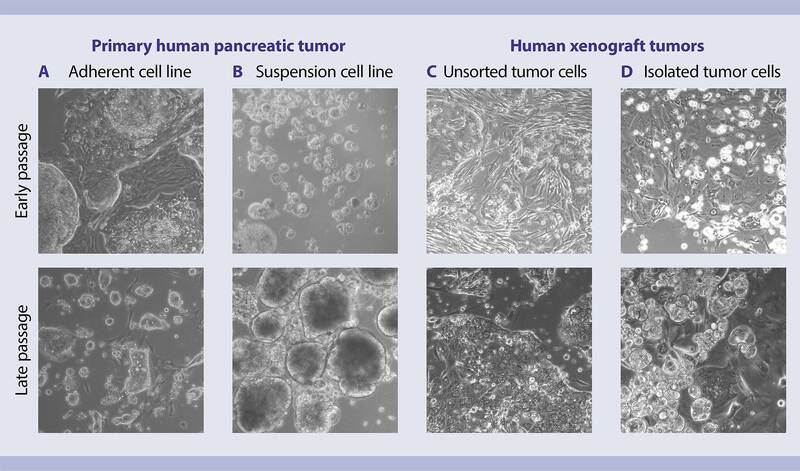 The Pancreas TumorMACS Medium has been developed for derivation and expansion of human tumor cell cultures from pancreatic tumors. The medium is optimized to generate primary cell cultures and cell lines from both primary patient tumors as well as xenotransplanted tumors. Properties of the generated cell cultures closely resemble the parental tumor, including expression of subtype-specific markers, cellular heterogeneity, genetic as well as epigenetic signatures, and tumorigenic potential. Using Pancreas TumorMACS Medium, cells can be plated directly after dissociation or after tumor cell isolation and both, adherent and suspension cells can be successfully expanded. Primary cell lines resemble the parent tumor, as morphological heterogeneity is preserved even in late passages. Cells were cultivated and propagated in vitro using Pancreas TumorMACS Medium directly after dissociation (A–C) and after tumor cell isolation (D). Morphological heterogeneity was preserved not only during initial passages but also in late passages when cell lines were derived from these cultures. The medium supported cell expansion both in adherent (A) and suspension cultures (B). This is of particular importance, as the data show that for some specimens even epithelial tumor cells grow better in a suspension culture of spheroid-like structures (B). While cell line–derived xenografts show a homogeneous histology, primary cell lines derived from primary tumors and propagated in Pancreas TumorMACS Medium retain their initial heterogeneity. After xenotransplantation, these cell lines closely resemble the parental patient tumor in histological analyses and thus are valuable in vivo tumor models. Cell line–derived xenografts fail to reflect the histological and functional features of primary human tumors since these cell lines show a homogeneous histology (A). Cell lines derived from primary human tumors and propagated in Pancreas TumorMACS Medium retain their initial heterogeneity. After xenotransplantation, these cell lines closely resemble the parental patient tumor in histological analyses (B). Long-term propagation of tumor cell lines in vitro harbors the risk of inducing bias in gene expression profiles, thus resulting in the divergence from parental tumors. In primary human cell lines propagated in Pancreas TumorMACS Medium, the global gene expression profile was maintained upon long-term cultivation as well as for primary cell line–derived xenotransplanted tumors.